The invitation-only event was held at the Embassy Suites, 1000 Woodward Place NE, Albuquerque. Adkins, of Albuquerque, is director of the Energy Technologies and System Solutions Center at Sandia National Laboratories. 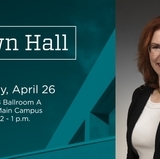 She received her bachelor of science degree in chemical engineering from UNM in 1981 and her Ph.D. in chemical engineering from the California Institute of Technology (Caltech) in 1987. She has served in a variety of roles at Sandia, including in supercritical carbon dioxide cleaning R&D, co-leading the Advanced Wafer Cleaning Project, and leading the CFC+3 replacement R&D from 1987-1996. 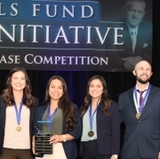 In 1995, she received the Department of Energy IWP/OIT Technology Commercialization Award for her work in Supercritical Carbon Dioxide Cleaning. 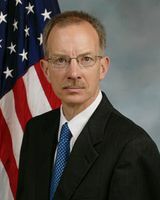 Adkins has served as deputy director of the nuclear weapons science and technology strategic area and the principal program director for the Defense Security Program. She served on the National Academies Board on Manufacturing, Engineering and Design from 2003-2006. In 2007, she served on the National Academies committee to assess the continuing need and value of the defense national stockpile, and the Panel on Manufacturing Engineering that assessed NIST’s Manufacturing Engineering Laboratory. She has mentored a number of undergraduate engineers at Caltech, and supported women at Sandia as co-chair of the Sandia Women’s Action Network. Adkins is the chair of the UNM Chemical & Biological Engineering Advisory Board and the UNM deputy campus executive at Sandia. In addition, Adkins was an author of the UNM-Sandia Strategic Alliance Memorandum of Understanding, signed by both institutions in July 2015. Brasure, of Washington, D.C., is deputy director and component acquisition executive in the Domestic Nuclear Detection Office of the U.S. Department of Homeland Security. Brasure earned a Ph.D. in nuclear engineering from the University of New Mexico in 1991. He also earned a bachelor’s degree in physics and astronomy from the University of Michigan in 1980, a master’s in systems management from the University of Southern California in 1983, and a master’s in nuclear engineering from the Air Force Institute of technology in 1985. In his current role, he is accountable to the director, a presidential appointee, for providing oversight of the interagency development of an integrated global nuclear detection architecture and forensics capability, including research and development; interagency coordination, synchronization and protocol development for a system for detection through alarm resolution, search, and response. Before joining the Department of Homeland Security, he was the director of the Air Force Office of Scientific Research, where he managed the entire basic research investment portfolio for the Air Force, leading a staff of 200 scientists, engineers, and administrators in the U.S. and offices in London, Tokyo, and Santiago, Chile. He also was the executive director of the Air Force Weapons Center at Kirtland Air Force Base. Earlier in his career, Brasure served as an adjunct professor of nuclear engineering at UNM. He has been an active-duty Air Force officer, and worked in the private sector prior to his selection to the senior executive service. Dexter, of Albuquerque, earned his bachelor’s and master’s degrees in mechanical engineering from UNM in 1975 and 1976, respectively, and his MBA from UNM in 2011. He is a professional engineer and is president of Bridgers & Paxton in Albuquerque. He was instrumental in the firm’s growth, and has held a variety of positions there since 1996: mechanical engineer, project manager, chief technical officer, business unit manager and principal. He began his career at L.W. Bickle & Associates of Albuquerque from 1977-79, then moved to New York City to work at Syska Hennessy from 1979 to 1996. He has been a supporter of a variety of School of Engineering initiatives, including serving as a member of the Regional Leadership Committee to raise money for the UNM Centennial Engineering Building, fundraising for the Formula SAE program, and serving as a member of the UNM Mechanical Engineering Advisory Council. He is currently vice chair of the School of Engineering Alumni Advisory Council. Dexter served on the board for Sandia Preparatory School for many years and chaired its Board of Trustees in 2009-10. Dexter is a member of the American Society of Heating, Refrigeration and Air Conditioning Engineers, serving as president of the New York City chapter from 1990-91. 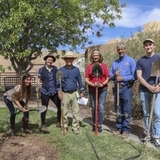 He is also a member of the Society of Fire Protection Engineers, the American Society for Healthcare Engineering, and the Board of Appeals for the Bernalillo County Building Department. Jennett, of Wimberley, Texas, received his Ph.D. in 1969 from the Department of Civil Engineering, specializing in environmental and water resources. He earned bachelor’s and master’s degrees from Southern Methodist University, in 1963 and 1966, respectively. He most recently was interim dean of Virginia Commonwealth University. Jennett was president of Texas A&M International University from 1996 to 2001, and served as provost and vice president for academic affairs at Clemson University for four years and was dean of Clemson’s College of Engineering for 11 years. Before joining Clemson, Jennett was professor and chairman of the civil engineering department at Syracuse University and associate professor of civil engineering at the University of Missouri-Rolla. Jennett was a member of the board of directors of Chicago Bridge and Iron Co. and served on the company’s supervisory board from 1997 to 2013. He was awarded the Bernard S. Rodey Award from UNM in 1999. He is vice chair of the UNM School of Engineering Council for Engineering Excellence and has received the outstanding engineering of the year awards from the Missouri Society of Professional Engineers and the South Carolina Society of Professional Engineers. McNally, of Albuquerque, is director of strategic development for Applied Technology Associates (ATA) and chairman of the New Mexico Optics Industry Association. He received a Ph.D. in electrical engineering from UNM in 1986. He earned a bachelor’s degree from Manhattan College and a master’s degree from the University of California, Santa Barbara. Before joining ATA, McNally was founding CEO and chairman of TruTouch Technologies Inc., which developed and marketed the world’s first non-invasive alcohol measurement product, recognized by Time magazine as an Invention of the Year in 2006. He was an associate professor and director of research at the physics department at the U.S. Air Force Academy. McNally is a fellow of the International Society for Optics and Photonics (SPIE), was inducted into the Sigma Xi, Tau Beta Pi, and Eta Kappa Nu Honor Societies. 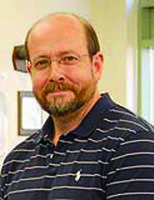 He serves on the UNM Health Science Center Conflict of Interest Committee and the advisory boards for the UNM Department of Electrical and Computer Engineering, the UNM optical science and engineering graduate program, and the Central New Mexico Community College photonics program. Jim is the proud father of four children with five grandchildren, and just celebrated his 40th wedding anniversary with his beautiful wife, Mary Ann. Van Dyke, of Albuquerque, is CEO of VanDyke Software Inc. He earned bachelor’s and master’s degrees from the UNM Department of Computer Science in 1991 and 1993, respectively. Van Dyke is the founder of VanDyke Software and was the initial developer of the company’s first product, the CRT terminal emulator. He works closely with his team to develop excellent software and provide exceptional customer support. He has established an endowed scholarship for undergraduate and graduate students in the department. Previously, Van Dyke was a research scientist and adjunct instructor for the computer science department at UNM. He is a strong supporter of the computer science department and takes an active interest in UNM’s annual Business Plan Competition. Jaramillo, of Albuquerque, is the recipient of the Young Alumni Award. He received a bachelor of science in civil engineering in 2000. Jaramillo is a professional engineer and a division director of program management for the New Mexico Department of Transportation. He began his career with a private engineering firm in the transportation department as an engineering intern and held a variety of roles, including serving as a staff engineer/project manager for 11 years. Some of his projects included the Montaño/Unser roadway improvements through the Petroglyph National Monument; the Isleta Boulevard Phase II (Rio Bravo to Arenal) project; and several roadway improvement projects in Arizona, California, Colorado, Nevada, and Oklahoma. From 2011 to 2014, he was the District 3 traffic engineer for NMDOT, and in 2014, he become division director of program management for NMDOT, where he is in charge of programming NMDOT’s over $300 million budget. Jaramillo is involved with the New Mexico Society of Professional Engineers, the Institute of Transportation Engineers and the Intelligent Transportation Society. He has been on the board of directors for the Albuquerque chapter for the New Mexico Society of Professional Engineers, where he served as president. 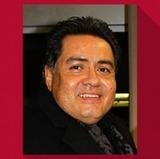 He was also very involved with the Hispanic Engineering and Science Organization (HESO) during his time at UNM and afterward as a professional member as a mentor to students.